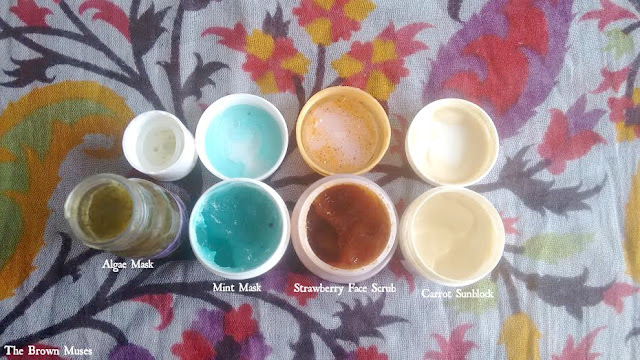 Skincare is no cake walk and what works for you depends on your skin type really. My skin esp. the T-Zone gets oily in summers due to excess humidity, and I need such products that do combat the oiliness but not at the cost of completely dehydrating the skin. A couple of weeks ago, I received a bunch of products from one of my favourite Indian skincare and hair care products, Aroma Essentials. The brand was generous enough to send skincare and hair care products that suited my skin and hair types and today in this post I shall be sharing my experience after using their products. I will be doing a separate post on the hair care products too very soon. Aroma Essentials is a range of skin care products that may make a useful addition to your daily skin care regimen. These include cleansers, sunscreens, moisturizers, exfoliants, facial cleansers, toners, retonoids, herbal and nutrient supplements, and cosmetics. 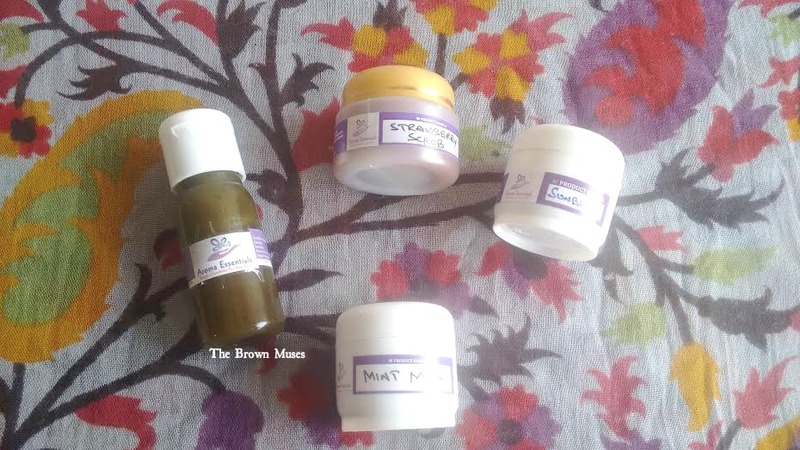 Natural handmade skin and hair care products. All our products are freshly handmade in small batches using the finest natural ingredients.we do not use harsh chemicals like petroleum or mineral oil.the color and scent of our products occur naturally from our ingredients and essential oils.no artificial colors and scents are added.store in a cool dry place away from sunlight. Algae Mask: The mask has a gooey/gel like consistency with minuscule algae particles, is dark henna-ish green in colour with no distinct fragrance. It spreads on the skin easily and lends it this totally amazing cooling sensation due to the presence of peppermint EO. I like using this mask 2 times a week usually after a long day at work because it instantly brightens up the complexion and rejuvenates tired skin without dehydrating it. The mask gets it's nourishing properties due to presence of yoghurt water, green algae and brown algae. Algae which is commonly known as "seaweed" acts as natural moisturiser and improves skin's barrier function by retaining water efficiently. The product is priced at INR 300 for 35 gms. It easily lasts up to 3-4 months if used 2 times a week. A tip: The mask works really really well along with brand's D-Tan Mask. Strawberry Face Scrub: A scrub plays a huge role in anybody's skincare routine, hence it's important to include one if ain't using already. Aroma Essentials Strawberry Face Scrub smells exactly like fresh strawberries. The scrub is rusty red in colour and has minuscule scrubbing particles suspended in a gooey paste. I use the scrub twice a week on a damp face (it's adviced to not scrub your facial skin more than twice a week as it will do more harm than good) and it removes the dead skin cells and grime without feeling abrasive. My skin feels super soft, supple and laced with a natural glow post use. Interestingly, strawberries are a rich source of Vitamin C which makes them acidic in nature that efficiently combats excess sebum on skin. They also possess natural bleaching quality therefore the scrub could prove useful in removing sun tan and acne scars if used consistently. The product is priced at INR 300 for 35 gms. It easily lasts up to 3-4 months if used 2 times a week though a bit pricey for the quantity. Carrot Sunblock: Out of all the products I have used from AE, this product has to be one of their best and you know what? It's their best-seller product. The product is light yellow in colour with a slight minty fragrance and is light in consistency. The product gets absorbed easily into the skin without feeling greasy or clammy. The sunblock gives this nice matte finish and one can easily skip the foundation. While the sun block is meant for normal to oily skin types, it works wonderfully well on dry skin too. The sunblock has SPF 30 in it due to the presence of carrot seed oil that possesses natural sunblock qualities. The sunblock protects skin from the harmful sun rays and prevents tanning to an extent. The product is priced at INR 300 for 35 gm. It lasts easily up to 2 months if used regularly though a bit pricey for the quantity it comes in. Mint Mask: The mask is sea blue in colour with gooey consistency and smells refreshingly awesome of peppermint. The mask spreads easily on the skin and leaves an amazing cooling sensation just like it's counterpart the algae mask from the same brand. The mask relieves sun damaged in an instant and imparts a healthy glow post use, alongside the skin feels fresh too. The mask contains peppermint EO, aloe vera, allantoin, basil seeds, guava extract, pro-vitamin B5. The product is priced at INR 300 for 35 gms. It easily lasts up to 3-4 months if used 2 times a week. Shea Moist (not pictured): The moisturiser has a gooey consistency and it's super easy to use and quite moisturising and very very light weight. It's a light chamomile fragrance which is soothing for the olfactory senses. It's great for all skin types as it provides the right kind of moisturisation the skin requires as the product contains the skin loving shea butter. Dry skinned beauties need to use twice the pea sized amount and pea sized amount of the moisturiser is sufficient for oily skinned beauties. I use the pea sized amount of product along with the carrot sunblock and massage gently on my skin, it gets absorbed easily and doesn't feel sticky or greasy. Sadly, I could not snap a picture of the product as my mother carried it along while she was travelling. The product is priced at INR 250 for 35 gm. Availability: You can find Aroma Essentials products on their Facebook page here or you may WhatsApp the brand on +91-7760988272 and the founder Madhurima shall address your queries therein. Disclosure: These products are PR samples and the views and opinions expressed hereby are strictly unbiased, based on my personal experience.